William Hyde was a Sherborne man, although he is known to have briefly lived and worked in Yeovil. Since his name is on the War Memorial in the Borough I have given him a page here. William Thomas Hyde was born in Sherborne, Dorset in 1886 the son of carpenter Henry Hide (b1859, Sherborne) and Susan née Jeans (b1857, Yeovil). William was baptised at Sherborne on 5 September 1886. In the 1891 census William was living with his parents and five siblings at Westbury, Sherborne. The family were still living in Sherborne at the time of the 1901 census and 14-year old William was working as an errand boy. In the autumn of 1907 at Wimborne, Dorset, William married Estella Sylvia Maude Habgood (b1889, Wimborne). They set up home at 4 Leigh Road, Wimborne, where William worked as a hairdresser and perfumer for Mr Warr of Half Moon Street, Sherborne. William and Estella had two children. They later moved to 46 Seaton Road and William worked for Frank Gaylard, hairdresser of Princes Street. William enlisted in Yeovil on 4 January 1917. He was initially enlisted into the Warwickshire Regiment but was soon transferred to 1st/8th (Isle of Wight, Princess Beatrice's) Battalion (Territorial Force), Hampshire Regiment. His Service Number was 40081. The battalion, attached to 163rd Brigade in 54th (East Anglian) Division, had landed in Gallipoli in August 1915 but had been evacuated from Gallipoli and moved to Egypt in December 1915. They later moved to Palestine as part of the Egyptian Expeditionary Force to make up numbers depleted from combat, disease and sever weather conditions. The battalion sailed to Alexandria and to an acclimatisation camp at Sidi Bish, then to Mena Camp by the Pyramids of Giza. They moved into deployment at the Bitter Lakes on the Suez Canal. In January 1917 they marched to Mazar and in February marched across the Sinai Desert 145 miles in 12 days to El Arish. On the night of 17 April 1917 the offensive against the Turkish line at Gaza began, supported by tanks. The first phase of the operation to capture the Sheik Abbas ridge went well, but one of the tanks, a Mark I male, "Sir Archibald", was destroyed by artillery. On the morning of 19 April the attack against the Sihan Redoubt commenced with the battalion in support of the 4th & 5th Norfolks. Eventually the redoubt was captured following a last charge by the other supporting tank, a Mark I female, "Nutty". The battalion sustained major casualties during the days attack. Two hundred were kept in reserve but out of 800 who went into action only two officers and ninety men answered roll call the following evening, some being taken prisoner and subsequently transferred to Austria. A trench raid against the Turks at Beach Post was regarded as a model of its kind, and earned the battalion high praise, as they captured a machine gun and two Lewis guns, as well as demolishing several dug-outs. The attack had been carried out at the point of the bayonet, one sergeant accounting for 13 Turks alone. General Allenby took overall command of the Palestine Campaign in August 1917 and his final successful assault against the Gaza-Beersheba Line saw the battalion attacking the trenches to the south of Gaza. Carrying out this task cost the battalion 2 officers and 51 other ranks killed. The Rifles then fought their way into Palestine, fighting in the Judaean Hills as Allenby entered Jerusalem. William Hyde was killed in action on 3 November 1901, while fighting in Palestine - probably during the Third Battle of Gaza (20 October to 7 November 1917). He was aged 31. On 23 November 1917 the Western Gazette reported "The Western Gazette 23 November 1917: On Tuesday, Mrs Hyde, of Westbury, Sherborne, received notification of the death of her husband, Private William Thomas Hyde, who was killed in the fighting in Palestine on November 3rd. Deceased, was the son of Mr and Mrs H Hyde of Dunmore Westbury, Sherborne, and was formerly employed by Mr Warr, hairdresser &c., of Half Moon Street, Sherborne. 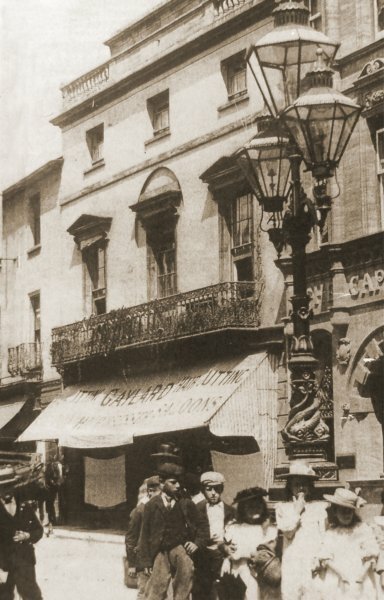 He subsequently worked for Mr FW Gaylard, of Princes Street, Yeovil, and lived at 46 Seaton Road, Yeovil. He enlisted on 4th January last, and was at first attached to the Warwicks, but was transferred to another regiment and sent to Egypt. Deceased, who was respected by a large circle of friends, was 31 years of age, and leaves a widow and two children. He has two brothers serving, one Frederick, being in France, and the other, Percy, in Mesopotamia." 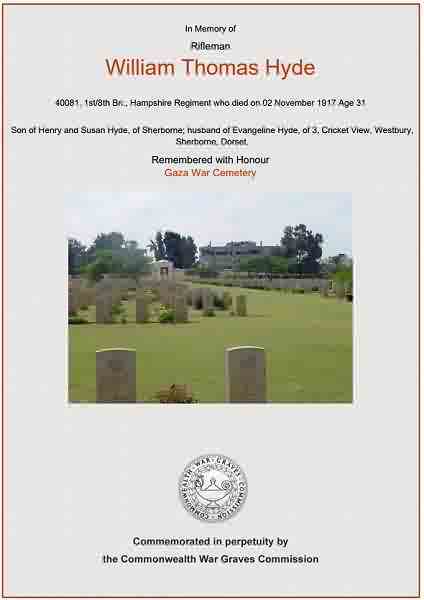 William Hyde was interred in Gaza War Cemetery, Israel. (Grave XXI.A.3). His name is recorded on the War Memorial in the Borough. The Commonwealth War Graves Commission certificate in memory of William Hyde.